There are at the last count nearly 600 known Passiflora species. Most are climbing vines but there are some species that are trees. 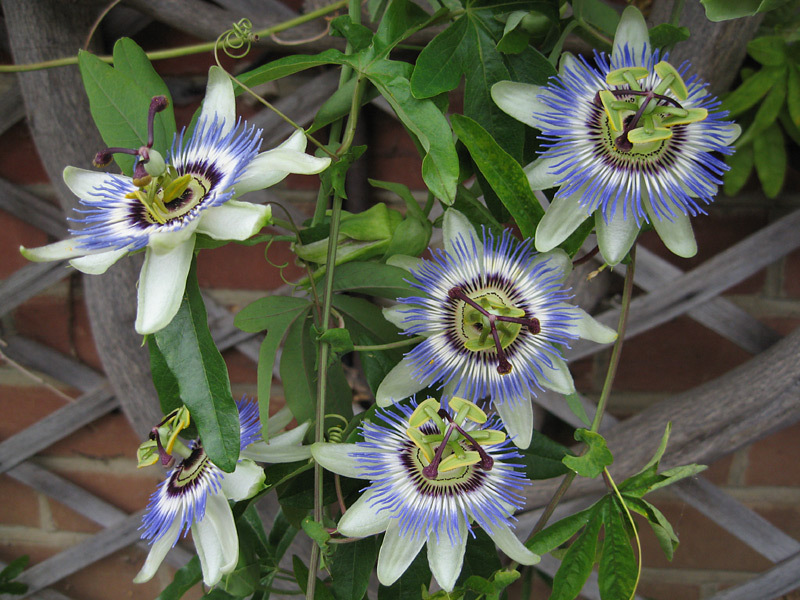 Passiflora caerulea, the common passion flower shown above, is the most well known. Taxonomy or systematics is the classification of organisms based originally on their visible similarity. Its weakness is that organisms that look very similar may not be closely related. For example one non-poisonous species of snake may mimic another poisonous species. Cladistics, also known as phylogenetics, is a more modern way of analysing taxonomic relationships using objective quantitative analysis of data usually from DNA and RNA sequencing. Put simply a clade is a group that genetic analysis suggests has a single common ancestor and it and its descendants that have evolved from it are grouped in the same clade. The information gained from these studies can then be used to tweak the existing taxonomic classifications. Passiflora species are classified as part of the Passifloraceae family and are all in the genus Passiflora. Linnaeus (1753) named 24 species. Killip (1938) split Passiflora into 22 subgenera naming 355 species. Later Feuillet and MacDougal (2003) introduced a simplified infrageneric classification of only four subgenera, namely Astrophea, Deidamioides, Decaloba and Passiflora. Species list Feuillet & MacDougal 2002 PDF. The Plant List. The most authoritative current list complied by Kew | Mobot, | NYBG | RBGE et al. Passiflora species list.